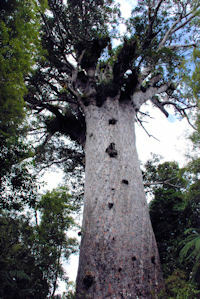 Just a three hour drive north of Auckland on State Highway 12 the giant kauri trees of the Waipoua Kauri Forest act as sentinels for the undiscovered jewel of Northland's west coast, the historic Hokianga Harbour. Known also as 'Te Kohanga o Te Tai Tokerau', the nest of the northern tribes as most Maori trace their ancestry to the discovery and settlement of this harbour, making it indeed the birthplace of the Nation. Well maintained tracks give access to the well known giants like 1400 year old Tane Mahuta and 2000 year Te Matua Ngahere, also many other forest walks including Yakas Track, Lookout walk and the Waiotemarama kauri and waterfall walks. Then discover several fabulous coastal walks including the Signal Station walk, with awesome sand dune views. Many quaint villages dot the Hokianga including the twin settlement of Omapere and Opononi made famous in 1955-56 by Opo the dolphin. Trips to 300 metre high sand dunes from here. Rawene, New Zealand's third oldest European settlement has historic Clendon House to visit as well as the recently completed mangrove walk. Kohukohu, is an historic timber mill town, while second oldest European settlement Horeke was an historic ship building town. Nearby Mangungu Mission House is the site of the second signing of the Treaty of Waitangi. 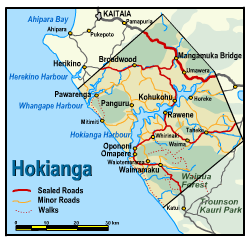 Hokianga has a wide range of accommodation, suiting the needs of all budgets, from Bed & Breakfasts, farm stays, backpackers and camping grounds to hotels and motels. There is plenty to see, do and explore including pony trekking, craft trail, carving, bush walks, sand dunes, fishing boating, swimming, golf, museum, great food at many cafes and eating establishments or just taking it easy in this wonderful relaxed atmosphere. The new vehicle ferry Kohu Ra Tuarua takes up to 21 cars a crossing providing a fast, comfortable trip across the Hokianga Harbour. First sailing from Rawene 7.30am and last sailing from the Narrows near Kohukohu at 8pm, it departs from Rawene on the half hour and the Narrows on the hour.